More than one-half of Facebook’s one billion account holders report playing Facebook games. 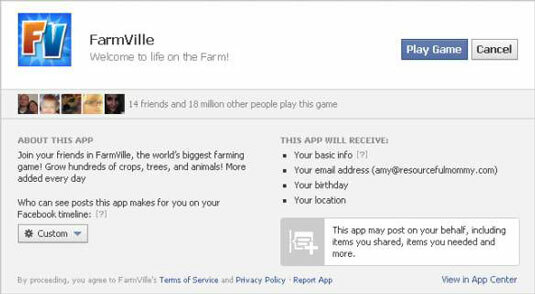 These game applications require access to your Facebook account — and thus might be a privacy concern for you and your children. Board games: Think checkers, chess, and Mahjong. Sports games: From fishing to baseball and football, sports games can be played solo or with a Facebook Friend. Arcade-style games: Arcade-style games are reminiscent of shooting games and original arcade video games. Puzzle games: Games focusing on strategy, logic, and quick reflexes fall into this category. Role-playing games: Role-playing games (RPGs) allow the player to take on the role of a character to complete tasks and journeys during the course of the game. Betting games: These games allow users to “bet” on games, such as bingo, poker, slots, and sports. Playing games on Facebook is free. However, some Facebook games have within-game options that require payment for access. For example, many games — including some role-playing games and betting games — allow users to pay money for the chance to win virtual rewards. Some games also require a fee to add features or tools to your game experience. In the United States, you can’t currently bet with and win actual money on Facebook. However, Facebook users in the UK can gamble through adults-only, highly regulated betting game apps. Participating in Facebook game play requires allowing game applications to access information in your Facebook profile. You might also have to set a list of permissions for that game application, such as posting in your Friends’ News Feeds on your behalf. For many parents, this is a privacy concern. You can, however, restrict the permissions you grant a Facebook game application while still being able to play that game. When you choose to play a game, a permissions screen appears, telling you the various permissions that particular game is requesting: for example, your e-mail address or your location. Go to Facebook and sign in to your account. 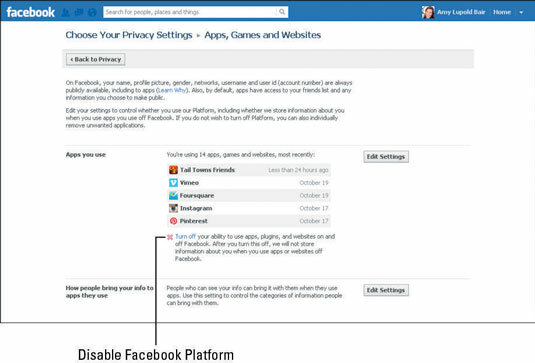 From the drop-down menu in the upper-right corner, choose Privacy Settings. Click the Edit Settings link to the right of the Ads, Apps and websites section. Click the Edit Settings button to the right of the Apps You Use section. Click Edit next to each game application to change what that game application may do through your account. 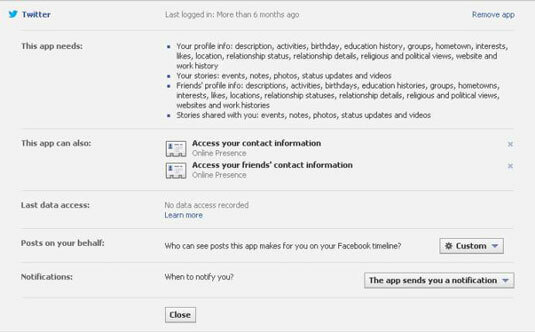 To control which applications may access your account through your Friends, follow Steps 1–3 of the preceding list, click the Edit Settings button for the How People Bring Your Info to Apps They Use section, and select what information you choose to share with apps being used by your Facebook Friends. Even though changing these settings will control what information from your accounts can be provided to game applications used by your teen’s Friends, she may still receive Facebook game invitations from her Friends on Facebook. Your teen can block all game invitations from Friends, though. Click the Manage Blocking link next to the Blocked People and Apps section. In the Block Invites From field, type the name of the Friend whose invitations you would like to block. The second option is to block specific game applications from contacting you or receiving nonpublic information about you from Facebook. 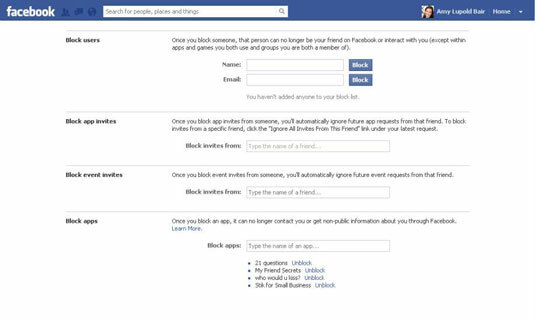 From the Blocked People and Apps section, find the Block Apps field, and type the name of the application whose contact and access to your nonpublic information you would like to block. 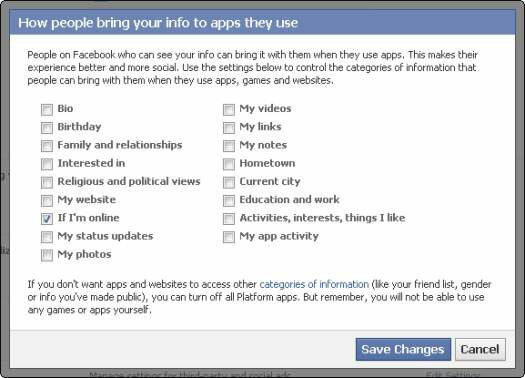 If you would like to allow your children or family to have a Facebook account, but you don’t want that account to have access to Facebook games and applications, you may choose to permanently opt-out of the Facebook apps platform. Disabling Facebook game applications makes that Facebook profile completely inaccessible to all apps, including games. Click the Edit Settings link next to Ads, Apps and websites. In the Apps You Use field, click the Turn Off link next to the red X. 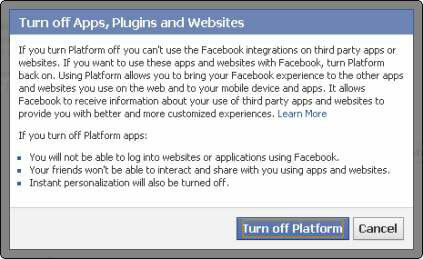 In the Turn Off Apps, Plugins and websites pop-up that appears, click the Turn Off Platform button. You won’t be able to log into websites or applications via Facebook. 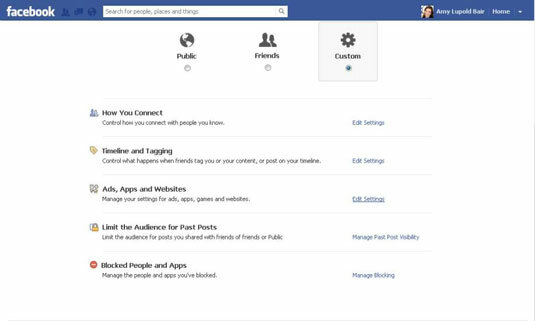 Your Facebook Friends can no longer interact and share with you using apps and other websites. Instant personalization is turned off for your account. Click the Edit Settings button of the Ads, Apps and websites section. Click the Edit Settings button next to the Apps You Use section. Click Edit next to the name of the game application you’d like to edit. Click the X to the right of Access Your Friends’ Contact Information. Following these steps for each game application with access to your account will restrict that game application’s access to your Friends’ Facebook accounts.